The MilanoInglese website was the first of its kind in Italy, a website promoting freelance English teachers in direct competition with language schools. The original site was created in 2010 with the aim of providing a simple to use, reliable and attractive platform for registered teachers. As all teachers who apply for registration are vetted prior to being allowed to join the site, automated registration was not considered necessary, so an HTML website was considered to be the ideal solution. Although the website covers many neighbouring cities, the site was optimised to target people looking for English teachers in the Milan area and, aided by quick loading and ease of use, the site achieved top 3 ratings on Google within a few months and has been in the top 3 ever since. The site has been updated on a regular program since creation, with the most recent addition being a teacher's blog in mid-2017. Like its (younger) sister websites RomaInglese and TorinoInglese, MilanoInglese is actually two websites; milanoininglese.it is the 'public' site, where clients can contact teachers and where registered teacher details are displayed. Its English-language sister milanoinglese.com is used to provide teacher information and is where teachers register to join the directory. The MilanoInglese website is part of a group of teaching websites in Italy which also includes RomaInglese and TorinoInglese, and these websites share the same basic design and operating concepts. The sites are run on a non-profit basis, with the focus on making the sites effective for registered teachers. 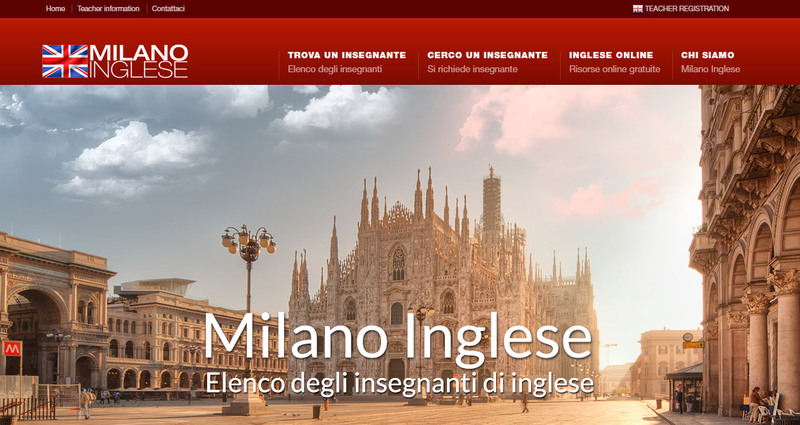 If you'd like to visit the MilanoInglese website, you can find it on Google by searching for things like 'inglese a milano', 'insegnante inglese a milano', 'lezione inglese a milano' or anything similar. You'll find the website in the top 3 results. Alternatively, just click the link below! Costs for a similar site; approximately £400 - £1000 depending on page numbers, required features and functionality.